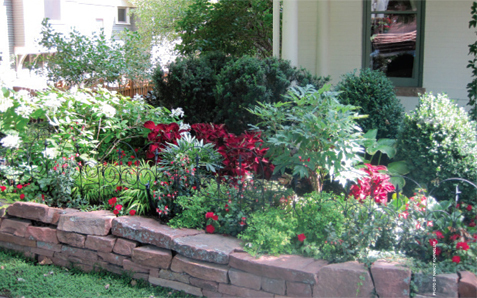 Shade gardens require a little extra TLC to be successful. Whether you’ve got tree shade, dappled shade or deep shade, here are some suggestions for growing plants in it. Shade gardening—nobody ever said it was easy, but why’s it so darn hard? First it’s too wet, then it’s too dry. The resulting straggly, struggling plants often wither and die. 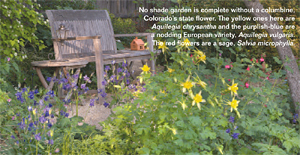 Shade gardening is difficult, but as Nancy Kornblum of Boulder discovered, a successful shade garden just takes time and experimentation. Her persistence paid off, and Kornblum now enjoys a beautiful shade garden bursting with color that requires minimal routine maintenance. A shade garden is its own unique environment, depending on its location. Different areas of a yard may be protected by the house from harsh winter weather, partially shielded from the sun by a fence, deeply shaded by an evergreen tree, or under the dappled canopy of an oak tree. Each of these environments presents issues to consider, including light exposure, soil structure, nutrients, moisture content and competition from other plants. Kornblum’s yard had many challenges: “When we moved in, it was just a giant weed patch,” she says. “We tackled it one bed at a time, and it’s been a very slow process.” But after trying several different plants in different areas, she finally found what worked. 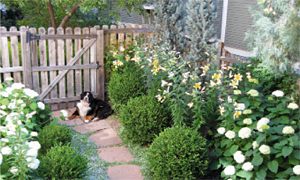 When considering a shade garden, your first step is to examine existing conditions. For example, do you have soil that drains well? Which areas are deeply shaded? 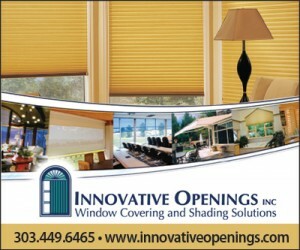 Does the shade change depending on the time of year? Next, determine which plants can tolerate the existing conditions or what adjustments must be made to accommodate your plant choices. Cultivating your shade garden will be easier and more successful if you choose plants with similar requirements, such as water needs and light requirements. 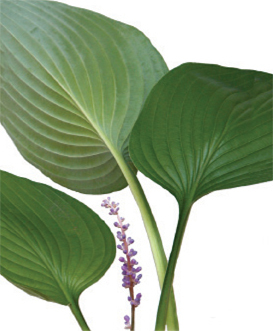 Shade gardens are great places to use plants with interesting foliage or colors, like Hosta, ferns and Brunnera. 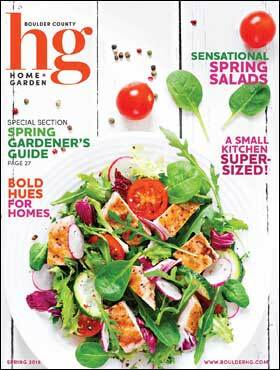 Heuchera is also easy to grow and there are several varieties that can add magnificent color to your garden. For example, Heuchera ‘Silver Scrolls’ has a silvery leaf with purple veining. Heuchera ‘Chocolate Ruffles’ has chocolate-colored leaves with burgundy undersides and a thickly ruffled edge. Large trees shade most of Kornblum’s yard, except for the rear, which gets a fair amount of sun. After resolving her soil issues, Kornblum’s next step was to make sure she had structure plants that worked in each area of her garden. In front, she planted Vardar Valley boxwoods and yews. On the yard’s east side she grew tall, narrow, columnar blue spruces, and tall, narrow yews in the deeper shade next to the house. But she managed to find some stunning varieties. 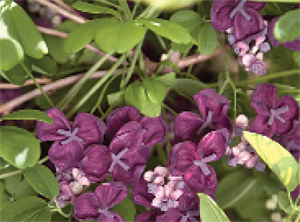 For instance, she planted Akebia quinata at the front of her house, where the garden is about 3 feet wide. This underused vine has very uniquely shaped purple flowers and produces amazing blue fruit. “It’s such a reliable plant, and stays green for a good part of the winter,” Kornblum says. On the east side she planted ‘Winter Gem’ boxwood, 5-foot-tall lilies and Annabelle hydrangeas—all of which make a lovely combination for this 10-foot side yard. Shade gardening can be difficult, but with a little bit of research, planning and effort, you too can find a plant combination that works in your yard. Include a sitting area if you have the space, and your shade garden will become a cool retreat where you can savor your garden during hot summer days. Agastache aurantiaca ‘Coronado’–Tolerates dappled shade and loves afternoon sun. Anemone x hybrida ‘Honorine Jobert’ – Likes dappled shade. Aquilegia caerulea (Colorado columbine) – Likes dappled shade. Astrantia – Likes well-drained soil and dappled shade; can tolerate afternoon sun. Brunnera macrophylla ‘Jack Frost’ – Likes moist soil and dappled shade. Ceratostigma plumbaginoides (plumbago) – Great for dry conditions under trees. Convallaria majalis (lily of the valley) – Grows well under conifers. Crocosmia ‘Lucifer’ – Likes filtered shade and tolerates drought. Geranium ‘Johnson’s Blue’ – Tolerates dry conditions. Helleborus x hybridus ‘Royal Heritage’– Tolerates drought, but likes to be watered during the flowering season. Heuchera ‘Chocolate Ruffles’, ‘Palace Purple’, ‘Silver Scrolls’ – Does best in moist soil and dappled shade, but tolerates all sorts of conditions. 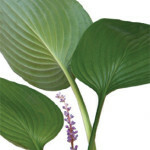 Hosta ‘Pacific Blue Edger’, ‘Royal Standard’, ‘Honeybells’ – Loves moist soil and deep shade. Trollius chinensis ‘Golden Queen’ – Does well in deep shade and semimoist conditions. Juniperus squamata ‘Blue Star’ – Adapts to filtered shade and dry soil. Juniperus sabina ‘Scandia’ – Adapts to filtered shade and dry soil. Picea glauca ‘North Star’ – Adapts to filtered shade with afternoon sun. Taxus x media ‘Hicksii’ – Thrives in deep shade with moist, well-drained soil. Taxus x media ‘Densiformis’ – Thrives in deep shade with moist, well-drained soil. Berberis thunbergii ‘Atropurpurea’ – Likes dry soil, filtered shade and a little afternoon sun. Berberis thunbergii ‘Helmond Pillar’ – Likes dry soil, filtered shade and a little afternoon sun. Buxus microphylla insularis ‘Green Velvet’ – Tolerates filtered shade to deep shade and dry conditions. Buxus microphylla sempervirens ‘Green Tower’ – Tolerates filtered shade to deep shade and dry conditions. Buxus microphylla insularis ‘Winter Gem’ – Tolerates filtered shade to deep shade and dry conditions. Cercocarpus ledifolius – Adapts to filtered shade and dry, harsh conditions. Cercocarpus montanus – Adapts to filtered shade and dry, harsh conditions. Euonymus fortunei ‘Emerald Green’ – Great for shade, tolerates almost any conditions. Euonymus fortunei ‘Blondy’ – Great for shade, tolerates almost any conditions. Euonymus kiautschovicus ‘Manhattan’ – Great for shade, tolerates almost any conditions. Ligustrum vulgare ‘Lodense’ – Adapts to all shade conditions. Ilex x meserveae ‘Berri-Magic Kids’ – Loves deep shade. Jamesia americana – A native that loves filtered or deep shade, and harsh conditions. Nandina domestica – Likes filtered shade and protection from wind and afternoon sun. 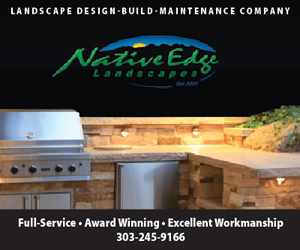 Julie Hauser is the owner of Indigo Landscape Design. She specializes in designing landscapes and gardens that are environmentally thoughtful, water-conscious and inviting to wildlife, and that incorporate edibles in an ornamental style. Next articleYard Art: Tacky or Tasteful?